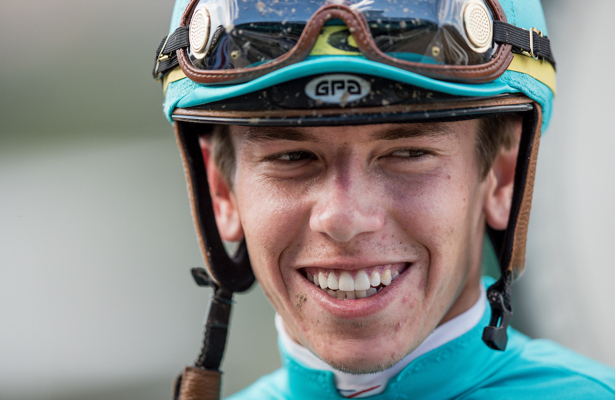 One of the new editions to the Churchill Downs jockey colony for the Fall Meet is Florida native Tyler Gaffalione. Through the first seven days of the 21-day meet, the 24-year-old rider has already made headway in the highly-competitive roster of journeyman riders at Churchill Downs with five wins from 32 starts. Woodford Racing’s Jefferson Cup winner Hot Springs was installed as the 2-1 morning line favorite as he tops a field of seven in Saturday’s 15th running of the Grade 3, $100,000 Commonwealth Turf at Churchill Downs. Hot Springs, a Kentucky-bred son of Uncle Mo, is perfect on the Matt Winn Turf Course with three victories to his résumé, including a 4 ¼-length maiden-breaking score on June 9 and a 1 ½-length allowance win on June 29 prior to his one-length win in the $100,000 Jefferson Cup on Sept. 29. The complete Commonwealth Turf field from the rail out (with jockey, trainer and morning line odds):Reride (Florent Geroux, Asmussen, 4-1); Marzo (Albin Jiminez, Ben Colebrook, 12-1); Sniper Kitten (Tyler Gaffalione, Mike Maker, 7-2); March to the Arch (Julien Leparoux, Mark Casse, 5-2); Year of the Kitten (CoreyLanerie, Maker, 15-1); Zero Gravity (Adam Beschizza, Joe Sharp, 8-1); Hot Springs (Santana, Asmussen, 2-1). The Commonwealth, run at 1 1/16 on the Matt Winn Turf Course for 3-year-olds, is carded as Race 9 with a post time of 5:06 p.m. (all times Eastern). First post on Saturday is 1 p.m. The smile was difficult to remove from 19-year-old apprentice jockey Declan Carroll’s face Wednesday as he ran back to the jocks room following a gutsy, rail-skimming ride aboard Space Mountain to capture Race 9 at Churchill Downs – his first victory beneath the historic Twin Spires. Carroll’s path to horse racing seems natural with his father, David, a former trainer and now assistant to Mark Casse and mother, Kim, an exercise rider for Casse. Carroll’s sister, Aisling, is an event rider with Olympic equestrian Phillip Dutton. Carroll has two wins through the first 16 mounts of his career and has made headway with several veteran trainers in Kentucky including Rusty Arnold II, Chris Hartman and Andrew McKeever.